5 Reasons You Need to Ditch Single Use Plastic Bags for Reusable Shopping Bags Today! You know reusable shopping bags are the right choice over single use plastic bags but in case you need some motivation, or some help convincing your friends or loved ones to make the change, here are five reasons you should stop using single use plastic bags and start carrying your groceries home in reusable shopping bags. Reduce Greenhouse Gases – The production of disposable plastic bags contributes to the creation of greenhouse gases that absorb infrared radiation, trap heat in the atmosphere, and contribute to the warming of the planet, or rather the greenhouse effect. When you use reusable shopping bags you are reducing the need, and ultimately the production, of disposable plastic bags. When less plastic bags are produced that means less greenhouse gases are unleashed on the planet. Convert Greenhouse Gases – If your reusable shopping bags are made from a plant material like bamboo, then not only are you reducing greenhouse gases, but the raw materials used to create your bags also helped to convert harmful greenhouse gases into safe and breathable oxygen. Through the process of respiration, plants convert carbon dioxide (a primary greenhouse gas) into oxygen. If you want to really ramp up this process think about getting reusable shopping bags made from jute or bamboo. A single bamboo plant can be harvested time and time again – the farmers need to let the plant grow for several years between harvesting, but the plant continues to grow and convert greenhouse gases into oxygen at an extremely high rate. 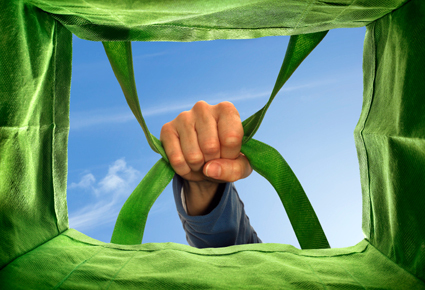 Get a Free Lunch– Many supermarkets offer a discount for each reusable shopping bag a customer brings and uses. The discount is typically about 5 cents per bag. Let’s say you shop once a week and you use 5 reusable shopping bags each time you shop. You’re saving 25 cents per trip to the store, but over the course of a year that adds up to $13 and a free lunch for you! You know reusable shopping bags are the right choice over single use plastic bags so make the switch. Make the World a Cleaner and Safer Place – Even when folks try to do the right thing and toss bags into the trash and recycle single use plastic bags, because they are so lightweight, they can easily be lifted by even the slightest breeze and carried off into the air. This airborne litter ends up lodged in trees or shrubs or billowing down your street. All litter is potentially harmful to animals, but plastic bag litter is especially dangerous since animals in the wild can become entangled in the bags, and this may prevent them from being able to defend themselves against predators or fend for themselves and their offspring. Unfortunately, many animals also mistake the stray plastic bags for food and when ingested the animals will die from the bags. When you use reusable shopping bags there are less plastic bags put into circulation, so less chances of litter. Make the Best Use of Your Tax Dollars – Another pitfall of single use plastic bag litter is the expense to clean it up. Aside from being an eyesore and harmful to wildlife and their habitats, plastic bag litter can also block drainage systems which are carefully engineered to move water in the event of a flood caused by a storm or a rainy season or even a spring thaw. When a drainage system cannot function properly, homes and businesses are put into harm’s way. If these systems are not cleared, devastating damage (and expensive cleanup costs) can result. Many cities take a proactive approach and pay a crew to remove the rubbish before a flood can result. Municipalities should spend their money to help ensure drainage systems function properly, but if plastic bag litter were no longer an issue then your tax dollar could be better spent on other needs. The advantages to using reusable shopping bags make them the clear choice over single use plastic bags. Single use plastic bags are responsible for so much damage and are such a waste of resources. These are just 5 of the reasons why you should ditch single use bags for reusable shopping bags. Share with us why you have switched to reusable bags.